This article is about the FCC commissioner. For the cricketer, see Ajit Pai (cricketer). 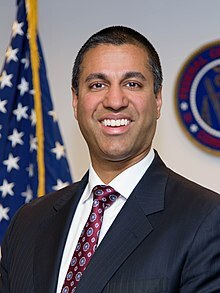 Ajit Varadaraj Pai (/əˈdʒiːt ˈpaɪ/; born January 10, 1973) is an American lawyer who serves as the Chairman of the United States Federal Communications Commission (FCC). He is the first Indian American to hold the office. He has served in various positions at the FCC since being appointed to the commission by President Barack Obama in May 2012, at the recommendation of Mitch McConnell. He was confirmed unanimously by the United States Senate on May 7, 2012, and was sworn in on May 14, 2012, for a five-year term. In January 2017, newly inaugurated president Donald Trump designated Pai as FCC Chairman. In March 2017, Trump announced that he would renominate Pai to serve another five-year term (remaining Chairman of the FCC). Pai was confirmed by the U.S. Senate for an additional five-year term on October 2, 2017. Before his appointment to the FCC, Pai held positions with the Department of Justice, the United States Senate, the FCC's Office of General Counsel, and Verizon Communications. Pai is a proponent of repealing net neutrality in the United States and, on December 14, 2017, voted with the majority of the FCC to reverse the decision to regulate the internet under Title II of the Communications Act of 1934. Ajit Pai was born on January 10, 1973, in Buffalo, New York, and grew up in Parsons, Kansas. His parents are Konkani immigrants from India: Varadaraj Pai, a urologist, and Radha Pai, an anesthesiologist. Both of his parents moved to the US in 1971 and were physicians at the county hospital. Pai attended his local high school, Parsons Senior High School, and graduated in 1990. He then went to Harvard University where he participated in the Harvard Speech and Parliamentary Debate Society. Pai graduated from Harvard in 1994 with an A.B. with honors in social studies. He then went to the University of Chicago Law School, where he was an editor of the University of Chicago Law Review and won the Thomas J. Mulroy Prize. He graduated with a J.D. in 1997. Following law school, Pai clerked for Judge Martin Leach-Cross Feldman of the U.S. District Court for the Eastern District of Louisiana. After moving to Washington, D.C., in 1998, Pai worked for the United States Department of Justice's Antitrust Division as an Honors Program trial attorney on the Telecommunications Task Force. There, he worked on proposed mergers and acquisitions and on novel requests for regulatory relief following the enactment of the Telecommunications Act of 1996. Pai left his Department of Justice post in February 2001 to serve as Associate General Counsel at Verizon Communications Inc., where he handled competition matters, regulatory issues, and counseling of business units on broadband initiatives. Pai left Verizon in April 2003 and was hired as Deputy Chief Counsel to the United States Senate Judiciary Committee's Subcommittee on Administrative Oversight and the Courts. He returned to the Department of Justice to serve as Senior Counsel in the Office of Legal Policy in May 2004. He held that position until February 2005, when he was hired as Chief Counsel to the Subcommittee on the Constitution, Civil Rights, and Property Rights. Between 2007 and 2011, Pai held several positions in the FCC's Office of General Counsel, serving most prominently as Deputy General Counsel. In this role, he had supervisory responsibility over several dozen lawyers in the Administrative Law Division and worked on a wide variety of regulatory and transactional matters involving the wireless, wireline, cable, Internet, media, and satellite industries. In 2010, Pai was one of 55 individuals nationwide chosen for the 2011 Marshall Memorial Fellowship, a leadership development initiative of the German Marshall Fund of the United States. Pai returned to the private sector in April 2011, working in the Washington, D.C., office of law firm Jenner & Block where he was a partner in the Communications Practice. In 2011, Pai was then nominated for a Republican Party position on the Federal Communications Commission by President Barack Obama at the recommendation of Minority leader Mitch McConnell. He was confirmed unanimously by the United States Senate on May 7, 2012, and was sworn in on May 14, 2012, for a term that concluded on June 30, 2016. Then Pai was designated chairman of the FCC by President Donald Trump in January 2017 for a five-year term. He was confirmed by the U.S. Senate for the additional five-year term on October 2, 2017. Pai has been an advocate for less regulation during his tenure on the FCC. He is seen as a closer ally to broadcasters than to other members of the FCC. In testimony before the U.S. House of Representatives Energy and Commerce Committee's Subcommittee on Communications and Technology on July 10, 2012, he warned about the dangers of regulatory uncertainty and the need for the FCC to keep pace with the dynamic communications sector. Pai also asserted that by reforming the way the commission works, the agency can facilitate the provision of new and better services at lower prices for American consumers. Pai gave his first major speech since taking office on July 18, 2012, at Carnegie Mellon University. He discussed how the FCC can help promote economic growth and enhance job creation in the information and communications technology field by adhering to three basic principles: (1) the FCC should be as nimble as the industry it oversees; (2) the FCC should prioritize the removal of regulatory barriers to infrastructure investment; and (3) the FCC should accelerate its efforts to allocate additional spectrum for mobile broadband. Pai called for a reinvigoration of Section 7 of the Communications Act, which gives the commission a one-year deadline to review proposals for new technologies and services. He introduced the idea of creating an IP Transition Task Force to expedite the country's transition to all-IP networks. He urged the commission to settle the nine-year-old contributions reform proceeding for the Universal Service Fund by the end of the year. Finally, he advocated for completing the rules for the AWS-4 spectrum band by September 2012 and conducting the broadcast spectrum incentive auctions by June 30, 2014. Pai wrote an op-ed for the Wall Street Journal in 2014 criticizing a proposed FCC study of the news-gathering practices of media organizations. In another 2014 letter, Pai criticized Netflix, writing that their Open Connect caching tools effectively secure fast lanes for its traffic. In October 2014, Pai wrote an op-ed in the Washington Post criticizing a government-funded research project named "Truthy" at Indiana University which was studying the spread of "false and misleading ideas, hate speech and subversive propaganda" online. Pai questioned the value of the project, writing, "should taxpayer money be used to monitor your speech and evaluate your 'partisanship?'" Truthy researchers defended the project, writing, "we do not monitor individual people. The tweets we analyze are public and accessible by anyone." Indiana University issued a press release which said "the Truthy project is a basic computing research project designed to provide analytical insight into the ways in which information is spread across social media networks such as Twitter." U.S. House Science Committee Chairman Lamar Smith sent a letter to the National Science Foundation announcing a review of the grant. In 2017, Pai removed from circulation a proposal introduced by Tom Wheeler which would have required cable providers to make their programming available on third-party devices. In a hearing on net neutrality in 2014, Pai said that he was committed to a free and open internet and that it was not the FCC's role to determine net neutrality. He testified that "a dispute this fundamental is not for us, five unelected individuals, to decide. Instead, it should be resolved by the people's elected representatives, those who choose the direction of government, and those whom the American people can hold accountable for that choice." Later, Pai voted against the FCC's 2015 Open Internet Order, classifying internet service under Title II of the Communications Act of 1934, which bars certain providers from "mak[ing] any unjust or unreasonable discrimination in charges, practices, classifications, regulations, facilities, or services." He said in December 2016 that he believed Title II net neutrality's "days were numbered," and was described by the New York Times as a stickler for strict application of telecommunications law and limits on the FCC's authority. In a speech two weeks before the FCC's scheduled December 2017 vote on net neutrality, Pai was critical of celebrities including Cher, Mark Ruffalo, and Alyssa Milano for boosting opposition to the planned repeal. In response to criticism from Ruffalo, Pai said "Getting rid of government authority over the Internet is the exact opposite of authoritarianism. Government control is the defining feature of authoritarians, including the one in North Korea." Pai said Twitter and other tech companies were hypocritical for arguing for a free and open internet while, according to Pai, such companies "routinely block or discriminate against content they don't like." The day before the FCC's scheduled vote on net neutrality, Pai appeared in a video entitled "Ajit Pai Wants The Internet To Know You Can Still Harlem Shake After Net Neutrality". The controversial video showed him dancing to the "Harlem Shake" and buying products online, including a toy lightsaber. In the video, Pai is shown dancing next to Martina Markota, a proponent of the Pizzagate conspiracy theory and a staff member at the Daily Caller, the media outlet that produced the video. In response to the video, Star Wars actor Mark Hamill said Pai was "unworthy" of holding the Jedi weapon, as "a Jedi acts selflessly for the common man." Baauer, the creator of the song featured in the video, has threatened to take legal action against Pai alongside his record label for Pai's use of the song in his video. As chairman, he also closed an investigation into zero-rating practices by wireless providers T-Mobile, AT&T, and Verizon. On May 18, 2017, the Federal Communications Commission took the first formal step toward dismantling the net neutrality rules, and on December 14, 2017, voted to reverse Title II regulations after a contentious public comment period. In February 2018, the National Rifle Association (NRA) awarded Pai with the Charlton Heston Courage Under Fire Award for repealing net neutrality rules despite facing heavy public criticism. As part of the award, a handmade Kentucky long gun was gifted to Pai. This gift caused former White House ethics attorney Walter Shaub to question if Pai, a federal employee, had violated ethics rules by accepting gifts from lobbyists such as the NRA. When the US Senate voted by 52-47 "to put the Federal Communications Commission's net-neutrality rules back in place" in May 2018, Pai was said to be "upset", stating having no net neutrality rules "will help promote digital opportunity" while making "high-speed Internet access available to every single American." Regarding "Democrats' effort to reinstate heavy-handed government regulation of the Internet", Ajit Pai conceded it would fail in the House. Pai argued against adoption of the FCC 2013 analysis and proposed rulemaking regarding the high cost of inmate telephone calls, referred to as Inmate Calling Service (ICS) by the FCC. He submitted his written dissent in which he argued that the nature of the exclusive single carrier contract between private ICS providers and prison administrators, meant inmates cannot "count on market competition to keep prices for inmate calling services just and reasonable." (ICS has become a $1.2 billion telecommunications industry and the two largest providers in the United States were private equity-backed companies). :23 Prior to the FCC's imposition of rate caps on interstate prison and jail phone calls in February 2014, the largest ICS provider Global Tel-Link (GTL) – which has been profitably bought and sold by private equity firms such as American Securities and Veritas Capital – charged some of the highest rates in the US – up to $17.30 for a 15-minute call. The 2013 FCC analysis, described how, in some cases, long-distance calls are charged six times the rate on the outside. Acting Chairwoman Clyburn concurred with her order and both Jessica Rosenworcel and Pai dissented and issued statements. Pai opposed the FCC imposition of "safe harbor" of 12 cents with a cap of 21 cents on private ICS providers like GTL and CenturyLink Public Communications, arguing instead for a "simple proposal to cap interstate rates, with one rate for jails and a lower rate for prisons" that are cost-based to protect providers and ensure "some return on investment." Pai also argued that the FCC was not well-equipped to micromanage rates at each and every prison. In 2015, Pai opposed rate caps on intrastate inmate calls over which courts have ruled the FCC has no jurisdiction, notwithstanding rates as high as $14 per minute. He raised concerns about the increased use of contraband cell phones in prisons. In November 2016, the ICS providers won a halt on the regulation rules. Pai criticized Democrats for appealing. Shortly after his January 23 confirmation as chairman, Pai withdrew support for the FCC case involving GTL and CenturyLink set for February 6, 2017, which had called for establishing FCC jurisdiction over rates set by states. In June 2017, the US Court of Appeals struck down a large part of the FCC's ICS order. In 2016, Pai called for an investigation of potential fraud among beneficiaries of the agency's Lifeline subsidy for telecommunication services, contending that "apparent duplicates" who had signed up for the program improperly received $476 million annually. He rescinded permissions for nine new broadband providers selected by the previous FCC to participate in the program (along with more than 900 others) after becoming agency chairman, stating the new providers had not followed FCC guidelines requiring them to coordinate with the National Tribal Telecommunications Association in order to participate in the Lifeline program. Pai argued the rules had been improperly circumvented by the previous Democratic chairman, former lobbyist Tom Wheeler. In November 2017, two Democratic members of the U.S. House of Representatives, John Conyers (Mich.) and David Cicilline (R.I.), asked David L. Hunt, the inspector general of the FCC, to investigate whether Pai's legislative actions regarding the relaxation of broadcast ownership rules were biased in favor of Sinclair Broadcast Group, a large owner of broadcast television stations that, since the formation of its now-defunct News Central format in 2003, produces conservative news and commentary segments that the group requires its stations to insert into certain local newscasts. The FCC, under Pai, undertook a number of actions that the legislators believe would benefit Sinclair – which has lobbied for such changes for several years – including rolling back certain broadcast television station ownership limitations (including allowing exceptions to duopoly rules that forbid common ownership of two television stations in the same market if both are among the four highest-rated or if such a combination would dilute independent media voices, reinstating a 1985 discount quota on UHF stations repealed two years earlier by Wheeler and his Democratic-led majority, a requirement dating to the FCC's inception for broadcast outlets to maintain office operations within the community of their primary local coverage areas, and removing ownership attribution rules applying to joint sales and shared services agreements). A spokeswoman for Pai said "the request appears to be part of many Democrats' attempt to target one particular company because of its perceived political views... Any claim that Chairman Pai is modifying the rules now to benefit one particular company is completely baseless." On July 10, 2010, Pai married Janine Van Lancker, a board-certified allergist, at the Willard InterContinental Washington. Pai lives in Arlington, Virginia, with Van Lancker and their two children. In 2017, Pai publicly complained that net neutrality protesters had targeted his family. Messages directed at his children were put up near his suburban Virginia home saying that "They will come to know the truth. Dad murdered Democracy in cold blood" and "How will they ever look you in the eye again?". No group took responsibility for the provocative signs, though the advocacy organization Popular Resistance left flyers on Pai's neighbors' doors that included his picture, age, and weight as part of a campaign they called "Ajit-ation". ^ a b c d e f g "Commissioner Ajit Pai". FCC.gov. Retrieved December 30, 2013. ^ "Trump's FCC: Tom Wheeler to be replaced, set-top box reform could be dead". November 10, 2016. Retrieved April 6, 2018. ^ "President Trump Designates Ajit Pai as Chairman of FCC". Jan 22, 2017. ^ Johnson, Ted (March 7, 2017). "President Trump Renominates Ajit Pai for New FCC Term". Variety. Retrieved April 6, 2018. ^ a b Shepardson, David (October 2, 2017). "Senate Confirms FCC Chairman to New Five-Year Term". U.S. News & World Report. Reuters. Retrieved April 6, 2018. ^ "FCC Chair Ajit Pai lauds Indian and Indian American contributions to U.S. leadership in technology". News India Times. March 30, 2017. ^ Pai, Ajit [@AjitPaiFCC] (February 20, 2016). "Got this in the mail recently. Love my Gujarati brethren, but I'm actually Konkani. #PainotPatel" (Tweet). Retrieved May 13, 2017 – via Twitter. ^ "Ajit Pai Nominated as Commissioner to FCC". Indian West. Reuters. November 9, 2011. Retrieved November 28, 2017. ^ "Trump Taps Commissioner Ajit Pai to Head FCC". Fortune. Reuters. January 23, 2017. Retrieved March 8, 2017. ^ "Indian-American Ajit Pai may head U.S. communication commission". The Hindu. January 18, 2017. ^ a b "Nominations of Jessica Rosenworcel and Ajit Pai to The Federal Communications Commission". Committee on Commerce, Science, and Transportation. November 30, 2011. S. Hrg. 112-480. Retrieved April 6, 2018. ^ "Our Distinguished Alumni". Harvard Speech & Parliamentary Debate Society. Retrieved April 6, 2018. ^ "Ajit Pai". Washington Post. Retrieved April 6, 2018. ^ "How FCC Chair Ajit Pai Took His Fight Against Net Neutrality to the Finish Line". Retrieved March 7, 2018. ...but the following year Kentucky senator Mitch McConnell recommended to president Obama that Pai would make a good FCC commissioner. ^ Shields Todd (March 7, 2017). "Trump Renominates Net Neutrality Foe Ajit Pai to FCC, Source Says". Bloomberg L.P. Retrieved April 30, 2017. ^ Flint, Joe (May 5, 2014). "FCC Commissioner Ajit Pai seeks peace with broadcasters". Los Angeles Times. ^ a b "Testimony of Commissioner Ajit Pai, Hearing on Oversight of the Federal Communications Commission" (PDF). Retrieved July 10, 2012. ^ "Unlocking Investment and Innovation in the Digital Age:The Path to a 21st-Century FCC" (PDF). Retrieved July 18, 2012. ^ a b "New FCC member wants nimble agency". Retrieved July 18, 2012. ^ Farhi, Paul (February 20, 2014). "Proposed FCC study of news organizations sparks conservative outcry". Washington Post. ^ "The FCC Wades into the Newsroom". Wall Street Journal. Retrieved March 3, 2014. ^ Wilhelm, Alex (December 11, 2014). "Netflix Fires Back At FCC Commish Pai's Allegation That It Is Building Internet Fast Lanes For Its Own Content". TechCrunch. ^ Pai, Ajit (October 17, 2014). "The government wants to study 'social pollution' on Twitter". The Washington Post. Retrieved May 18, 2017. ^ Farrell, Henry (October 22, 2014). "No, the National Science Foundation is not building an Orwellian surveillance nightmare". Washington Post. Retrieved May 18, 2017. ^ Bikoff, Ken (October 23, 2014). "Statement about the Truthy project from Indiana University" (Press release). Indiana University School of Informatics and Computing. Retrieved May 18, 2017. ^ "Smith Reviews NSF-Funded Project Targeting Conservative Political Speech on Twitter" (Press release). Washington, D.C.: House Committee on Science, Space, & Technology. November 10, 2014. Retrieved May 19, 2017. ^ Brodkin, Jon. "FCC Chairman Pai Takes Wheeler's Set-Top Box Plan Off the Table". Ars Technica. Wired Media. Archived from the original on January 30, 2017. Retrieved April 19, 2018. ^ Wyatt, Edward (May 15, 2014). "F.C.C. Backs Opening Net Neutrality Rules for Debate". New York Times. Retrieved December 14, 2017. ^ Boliek, Brooks (February 19, 2015). "Net neutrality's chief critic". Politico. Retrieved April 6, 2018. ^ "FCC's Ajit Pai says net neutrality's "days are numbered" under Trump". Ars Technica. Retrieved April 6, 2018. ^ Brodkin, Josh (November 28, 2017). "Ajit Pai blames Cher and Hulk actor for ginning up net neutrality support". Ars Tecnica. Retrieved April 6, 2018. ^ Fiegerman, Seth (November 28, 2017). "Trump's FCC chairman accuses Twitter of silencing conservatives". CNN. Retrieved April 6, 2018. ^ Snider, Mike (November 22, 2017). "FCC Chairman takes on net neutrality critics including Cher and Hulk". USA Today. Retrieved April 6, 2018. ^ a b Mayfield, Mandy (December 14, 2017). "FCC chair Ajit Pai dances with 'Pizzagate' conspiracy theorist in promo video for net neutrality repeal". Washington Examiner. Washington DC. Retrieved April 6, 2018. ^ Chatain, Daniel (December 13, 2017). "'Star Wars' actor Mark Hamill: FCC Chairman Ajit Pai 'unworthy' of wielding lightsaber". Washington Examiner. Washington DC. Retrieved April 6, 2018. ^ Bein, Kat (December 14, 2017). "Baauer 'Taking Action' Against FCC Over 'Harlem Shake' Net Neutrality Repeal Video". Billboard. Retrieved April 6, 2018. ^ Kang, Cecilia (February 5, 2017). "Trump's F.C.C. Pick Quickly Targets Net Neutrality Rules". The New York Times. The New York Times Company. Retrieved April 6, 2018. ^ Harding McGill, Margaret (May 18, 2017). "FCC kicks off effort to roll back net neutrality rules". Politico. Retrieved April 6, 2018. ^ Kang, Cecilia (December 14, 2017). "F.C.C. Repeals Net Neutrality Rules". New York Times. ISSN 0362-4331. ^ "The FCC just killed net neutrality". The Verge. Retrieved April 6, 2018. ^ Sanchez, Luis. "Shaub presses FCC chief over possible ethics violation with NRA gift". The Hill. Retrieved April 6, 2018. ^ Brodkin, Jon. "ISPs and Ajit Pai are really sad about Senate's vote for net neutrality". Ars Technica. Retrieved May 23, 2018. ^ Wolverton, Troy; Perticone, Joe. "The US Senate votes in favor of restoring the FCC's net-neutrality rules". Business Insider. Retrieved May 23, 2018. ^ a b Mark Wigfield, ed. (August 9, 2013). "FCC Bars High Rates for Long Distance Phone Calls in Jails and Prisons Nationwide: Reforms Bring Relief to Millions of Families By Reducing the Cost of Interstate Long-Distance Calls" (PDF). Federal Communication Commission News. Retrieved February 5, 2017. ^ a b "Dissenting Statement of Commissioner Ajit Pai as Delivered at the August 9, 2013 Open Agenda Meeting" (PDF). FCC. August 9, 2013. p. 3. Retrieved February 5, 2017. ^ Timothy Williams (March 30, 2015). "The High Cost of Calling the Imprisoned". New York Times. Retrieved June 22, 2016. ^ Ryan Dezember (April 17, 2014). "American Securities Puts Prison-Phone Operator GTL on Block". Wall Street Journal. Retrieved June 22, 2016. ^ Sasso, Brendan (August 9, 2013). "FCC limits price of prison phone calls". The Hill. ^ Lecher, Colin (June 13, 2017). "The FCC can't cap the cost of in-state prison phone calls, court rules". the Verge. ^ Fung, Brian (October 22, 2015). "Calling a prison inmate can cost $54 a pop. The FCC thinks that's way too high". Washington Post. ^ US Court of Appeals For the District of Columbia Circuit (June 13, 2017). "Global Tel*Link v. FCC No 15-1461 Opinion" (PDF). Retrieved December 14, 2017. ^ Takala, Rudy (June 8, 2016). "Commissioner says fraud from Obamaphone program approaching $500 million". Washington Examiner. ^ "Setting the Record Straight on the Digital Divide". February 7, 2017. ^ Cecilia Kang (November 16, 2017). "F.C.C. Opens Door to More Consolidation in TV Business". New York Times. The New York Times Company. Retrieved November 20, 2017. ^ Ted Johnson (November 15, 2017). "Senators Seek Investigation of FCC Review of Sinclair-Tribune Merger". Variety. Penske Media Corporation. Retrieved November 20, 2017. ^ Johnson, Ted (October 24, 2017). "FCC Eliminates Rule That Required Stations to Have a Main Studio in Local Coverage Area". Variety. Retrieved October 24, 2017. ^ Fung, Brian (October 24, 2017). "The FCC just ended a decades-old rule designed to keep TV and radio under local control". Washington Post. Retrieved October 24, 2017. ^ Shields, Todd (October 24, 2017). "Broadcasters No Longer Need a Local Studio as FCC Changes Rule". Bloomberg. Retrieved October 24, 2017. ^ Hayes, Dade (October 24, 2017). "FCC Votes To End 77-Year-Old "Main Studio Rule" In Boost To Sinclair". Deadline Hollywood. Retrieved October 24, 2017. ^ Fung, Brian (October 24, 2017). "FCC ends decades-old rule designed to keep TV and radio under local control". Chicago Tribune. Retrieved October 24, 2017. ^ Shepardson, David (November 13, 2017). "House Democrats seek probe of FCC chairman's treatment of Sinclair". Reuters. Retrieved November 17, 2017. ^ Brodkin, Jon (November 13, 2017). "Lawmakers demand investigation into FCC Chairman Ajit Pai". Ars Technica. Retrieved November 17, 2017. ^ Richard Prince (November 19, 2017). "FCC Vote Advances Big Media. Will It Harm Diversity?". The Root. Univision Communications. Retrieved November 20, 2017. ^ McCarthy, Ellen (July 25, 2010). "Wedding: Janine Van Lancker and Ajit Pai". Washington Post. ^ Bucher, Chris (2017-11-22). "Janine Van Lancker, Ajit Pai's Wife: 5 Fast Facts You Need to Know". Heavy.com. Retrieved 2017-12-18. ^ a b Glaser, April (November 27, 2017). "Racist, Threatening Attacks on FCC Chair Ajit Pai Won't Save Net Neutrality". Slate. Washington, DC. Retrieved November 27, 2017. ^ Shaban, Hamza (November 27, 2017). "FCC chairman Ajit Pai says his children are being harassed over net neutrality". Washington Post. Washington, DC. Retrieved November 27, 2017. ^ Chaitan, Daniel (May 20, 2017). "'Net neutrality' activists taking photos of the inside of FCC Chairman Ajit Pai's home: Report". Washington Examiner. Washington, DC. Retrieved May 20, 2017. ^ John Zangas and Anne Meador (May 7, 2017). "Net Neutrality Activists Take on New FCC Chairman". Popular Resistance. Retrieved May 7, 2017.